Our right to clean air is enshrined in EU law. In fact air pollution was one of the first environmental issues tackled by the EU. However up to one-third of the EU urban population is still exposed to air pollution which exceeds legal limits that should have been met by 2010: 17 EU Member States are in breach of limits for particulate matter pollution (PM10) and 22 breach nitrogen dioxide limits. The UK itself is unlikely to comply fully with legal limits until 2025. This has a major impact on human health. Air pollution is recognised as the world’s largest environmental health risk causing over 400,000 premature deaths each year in the EU and 29,000 in the UK alone. In theory, under EU law citizens in those Member States could go to court to demand that action is taken by national governments to clean our air. In reality, this is a difficult undertaking. 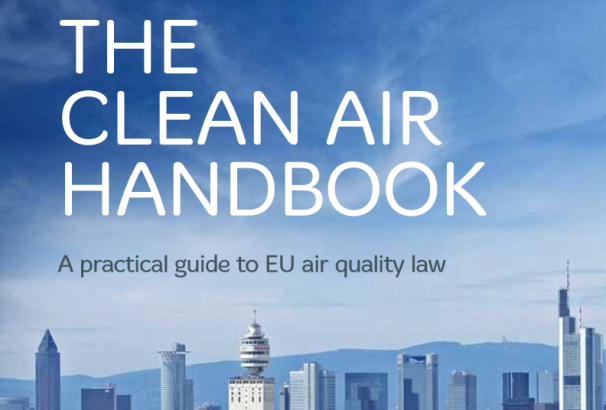 The Clean Air Handbook has been written by Healthy Air Campaign partner, ClientEarth, to give people across Europe a straightforward, easy to use guide to EU air quality law. Based on ClientEarth’s knowledge and experience of advocating for healthy air and the legal case against the UK Government, the handbook provides an overview of the relevant aspects of EU law. It also offers practical tips on how they can be used to fight for clean air, including how to make a freedom of information request, whether you are a concerned citizen, an experienced campaigner or an environmental lawyer.